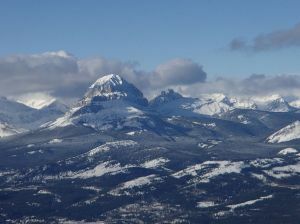 This peak is #52 in Prominence List for Alberta .A striking summit due to its soaring faces and isolated nature. Geologically speaking it is quite interesting and is known as a klippe. In layman's terms it is a bit of older rock that has 'floated' eastward from the main divide on a strata of younger rock. From a mountaineering perspective, it is a long scree slog to the summit. There is one steep step that requires some scrambling (protected in the late 80's by a dubious bolt and quarter inch polypropolene rope). However the views out onto the prairies are well worth the trudge up. Name Notes: Like the pass, river, highway, etc it was named after a sighting of nesting ravens in the area by Captain Blakiston during his explorations.